Green tea may elevate metabolism and help burn fat, and agave nectar provides a low-glycemic sweetener. Green tea with agave offers a natural alternative to sodas and other sugary drinks. Preliminary research suggests green tea promotes weight loss. Your choice of sweetener and how much of it you use can also affect weight loss. Your choice of beverage can have a significant impact on your weight loss efforts. It takes a 3,500-calorie deficit to lose 1 lb. Drinking sugar-sweetened sodas, iced teas and coffeehouse drinks can add a significant number of excess calories to your daily intake, the Centers for Disease Control and Prevention reports. Switching from sweetened bottled iced tea to green tea with agave could help stabilize your blood sugar -- and increase your antioxidant intake. Agave nectar raises your blood sugar more slowly than sugar, honey or fructose, the American Diabetes Association reports. Freshly brewed green tea contains five to 10 times more flavanoids -- components of tea with antioxidant activity -- than the average ready-to-drink bottled tea, the Agricultural Research Service reports. The caffeine and antioxidants in green tea promote weight loss, according to preliminary studies. In a review of the fat-fighting effects of green tea with an emphasis on human studies, researchers from Provident Clinical research note that green tea antioxidants and caffeine may increase energy expenditure and oxidize fat due to influencing the sympathetic nervous system. The researchers published their findings in January 2011 in "The Journal of Nutritional Biochemistry." High-glycemic sweeteners such as sugar and high-fructose corn syrup can cause blood sugar to rise rapidly and then crash, resulting in food cravings and the risk of consuming excess calories. A diet high in sugar and high-glycemic processed foods are associated with overweight, heart disease and diabetes, the Harvard School of Public Health reports. 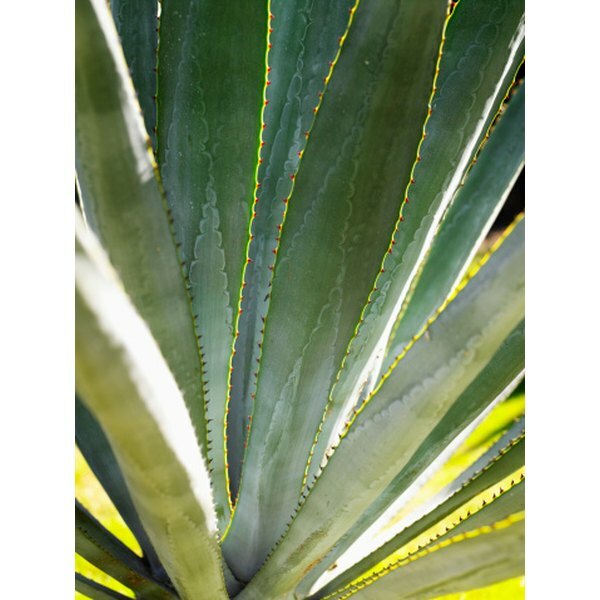 Agave nectar, although low-glycemic, contains calories and carbohydrates. A 1-tsp. serving of agave nectar contains 15 calories and 4 g carbohydrates, the same as other caloric sweeteners. Keeping your blood sugar stable helps to curb your appetite so that you can stick to a moderate reduced-calorie diet for weight loss. Managing your blood sugar through choosing low glycemic foods and drinking green tea with low-glycemic agave may help you reduce your calorie intake and maintain consistent energy levels for exercise to succeed at weight loss. Using a 15-calorie 1 tsp. serving of agave in green tea to satisfy your sweet tooth could help you reduce calories, if you use it as a substitute for higher calorie beverages, such as regular sodas or high-sugar commercial iced teas.